Download "STATE OF NEVADA Department of Administration Division of Human Resource Management CLASS SPECIFICATION"
1 STATE OF NEVADA Department of Administration Division of Human Resource Management CLASS SPECIFICATION TITLE GRADE EEO-4 CODE YOUTH PAROLE COUNSELOR III 40* B YOUTH PAROLE COUNSELOR II 39* B YOUTH PAROLE COUNSELOR I 35* B SERIES CONCEPT Youth Parole Counselors provide supervision, enforce parole agreements and stipulations, and determine appropriate placement, counseling, educational goals, and work programs of assigned youth; work directly with community-based placements, rehabilitation and counseling programs, schools, the juvenile justice system, local law enforcement agencies and families in developing an appropriate parole and treatment program. Meet with juvenile institution staff, youth, juvenile judges, counselors, families and placement centers to develop parole and treatment plans, goals and objectives; monitor activities of youth while institutionalized and develop an aftercare program to guide reintegration into the community. Act as a liaison with a variety of community agencies including neighborhood resource teams, schools, counseling and treatment centers, juvenile justice system, State and county welfare, and community-based placements to coordinate the treatment, counseling and supervision needs of youth. Document all contact involving youth, family and legal interactions within a statewide database; collect appropriate data regarding caseload interaction and report data according to established requirements and timelines. Monitor progress reports and compile data for inclusion in the automated information system from the institution, community-based placements, school, work, treatment programs and direct observation; prepare file notes, required forms and reports to reflect ward s progress or violation of stipulated agreements, program rules and regulations and take appropriate action; recommend and facilitate the implementation of the parole plan and submit to supervisor for review. Meet with assigned youth on a regular basis and conduct unscheduled visits at home, at work, or in school; discuss parole and treatment goals and accomplishments; correct inappropriate behavior or violations; recommend and assist youth in developing objectives to meet parole requirements. Provide guidance and counsel youth and family regarding rules, appropriate behavior, program opportunities, personal or family problems, emergency situations and medical or psychological needs; make appropriate referrals and encourage behavior modification; chronologically document information received from youth, family, referral services, and State agencies and develop required reports. Perform enforcement activities regarding parole violations; assist local law enforcement and State agencies; locate, apprehend, transfer, arrest, book and detain youth; appear in court with child when adjudicated and prepare necessary paperwork such as petitions, judge orders, and revocations. Investigate and make placement decisions regarding interstate compact of juveniles from other states; visit family or relatives and conduct home survey; recommend approval or denial to grant residency in the State. * Reflects special salary adjustments of 3 grades granted by the Legislature to improve recruitment and retention. 2 Page 2 of 5 SERIES CONCEPT (cont d) Appear as an officer of the court at court hearings, set court dates and coordinate with parents and District Attorneys; ensure compliance with court orders including counseling, restitution, community service, and special placement; prepare various court documents and reports including Parole Agreements, Violation Reports, Review Hearing Reports, social histories, dispositional reports, certification reports and termination reports; provide recommendations to court regarding detention, alternative placement, termination and revocation of parole. 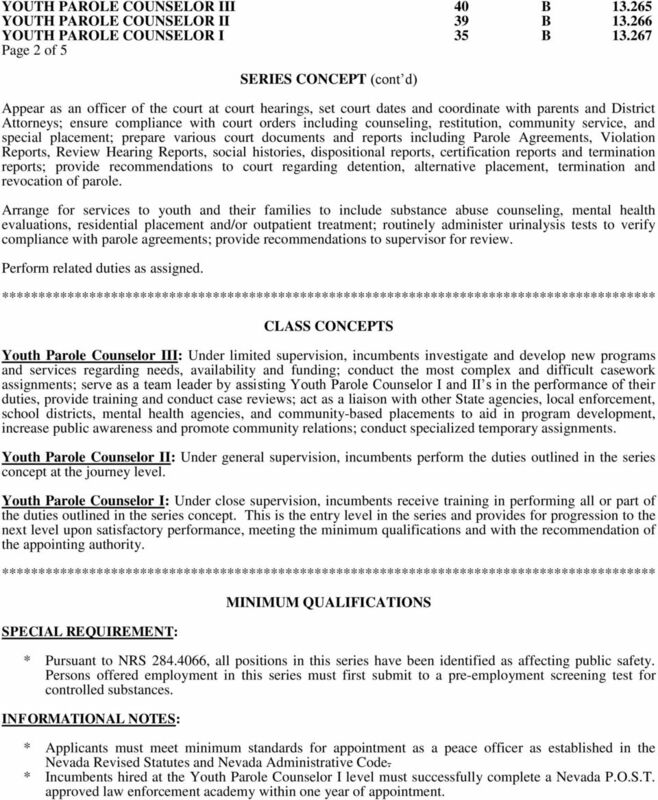 Arrange for services to youth and their families to include substance abuse counseling, mental health evaluations, residential placement and/or outpatient treatment; routinely administer urinalysis tests to verify compliance with parole agreements; provide recommendations to supervisor for review. Perform related duties as assigned. ****************************************************************************************** CLASS CONCEPTS Youth Parole Counselor III: Under limited supervision, incumbents investigate and develop new programs and services regarding needs, availability and funding; conduct the most complex and difficult casework assignments; serve as a team leader by assisting Youth Parole Counselor I and II s in the performance of their duties, provide training and conduct case reviews; act as a liaison with other State agencies, local enforcement, school districts, mental health agencies, and community-based placements to aid in program development, increase public awareness and promote community relations; conduct specialized temporary assignments. 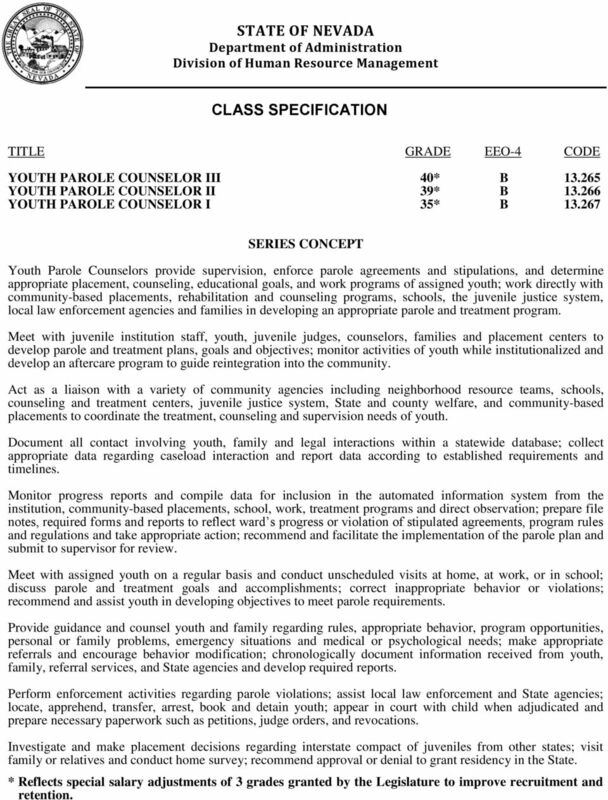 Youth Parole Counselor II: Under general supervision, incumbents perform the duties outlined in the series concept at the journey level. 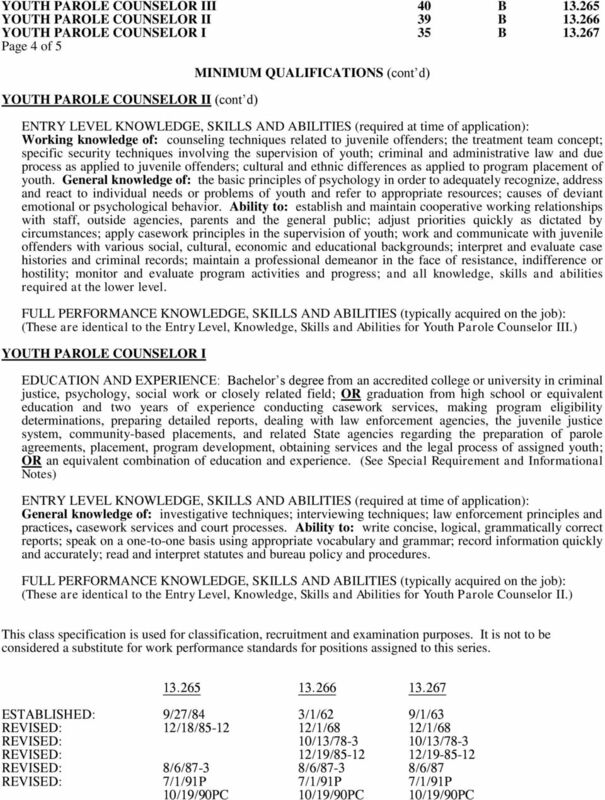 Youth Parole Counselor I: Under close supervision, incumbents receive training in performing all or part of the duties outlined in the series concept. This is the entry level in the series and provides for progression to the next level upon satisfactory performance, meeting the minimum qualifications and with the recommendation of the appointing authority. ****************************************************************************************** SPECIAL REQUIREMENT: MINIMUM QUALIFICATIONS * Pursuant to NRS , all positions in this series have been identified as affecting public safety. Persons offered employment in this series must first submit to a pre-employment screening test for controlled substances. INFORMATIONAL NOTES: * Applicants must meet minimum standards for appointment as a peace officer as established in the Nevada Revised Statutes and Nevada Administrative Code. 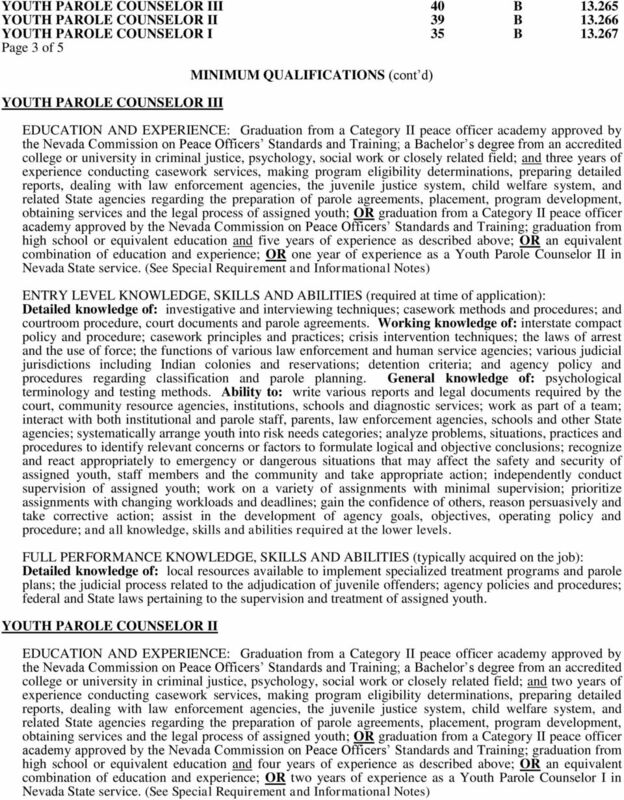 * Incumbents hired at the Youth Parole Counselor I level must successfully complete a Nevada P.O.S.T. approved law enforcement academy within one year of appointment. County Administrator Our mission is to deliver quality public services to the citizens in an effective, professional and efficient manner. Each youth shall be provided individualized services and supervision driven by his/her assessed risk and needs.